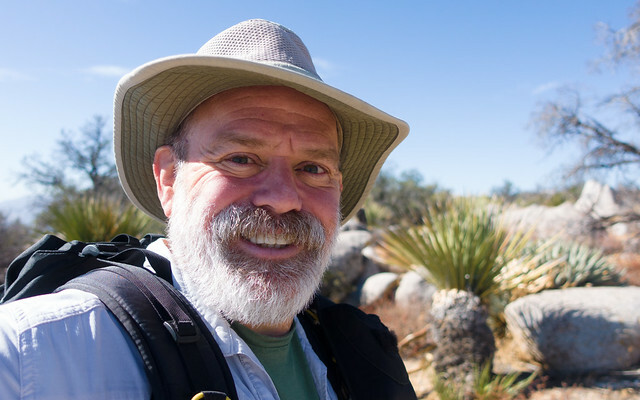 It’s wintertime, again, so it’s time to go hiking in the desert. 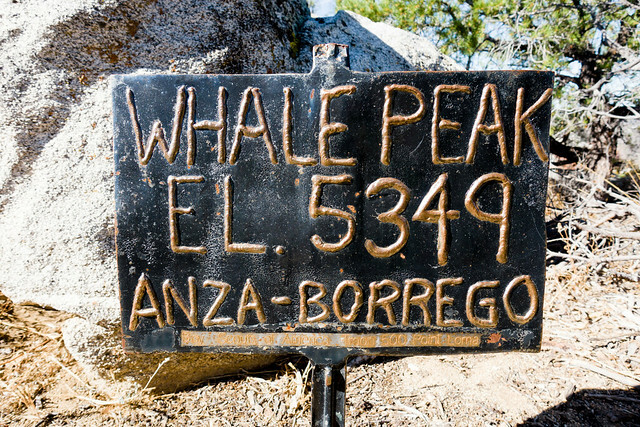 Today’s hike was up Whale Peak in Anza-Borrego State Park. 5 miles (9km), about 3 1/2 hours, temp around 68F (20C), 1700' elevation gain from the trailhead to the top. Not really much to report. Some guy had setup camp at the trailhead and was shocked to see us approach his very elaborate campsite, he looked up from slicing potatoes with a ridiculuous 10 inch knife and said to me and Chris "Can I help you?". Uh yeah, you set up your tent on the trail but no biggie, I just said "We're climbing up Whale Peak!" He said "Are you sure, have you been here before?" and I bluffed and said "Of course, the trail goes up this bouldery bit about 400 meters, then through some grassy flats and ridgeline to the peak." 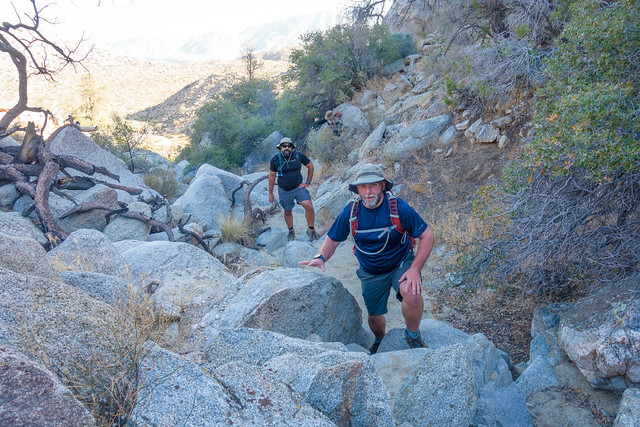 He said "Well, I don't know about that, there's nothing up the wash, I've been up there" so I said cheerily "Well, when you get to the top of the boulders, look for the use trail, and just follow it straight on up! See you when we get back!". At that point he spotted Kevin and Vaughn behind us, and maybe he thought he couldn't fend off all of us with his potato knife, so he brightened up and said "Have a good hike" and went back to his brekkie. After that odd encounter we saw no one else--and he wasn't there when we passed his camp on the way back. So, here's what it looked like. The first bit was a short little scramble up a rocky wash. I didn't lie, it was about a ten minute walk up. At the top, there was a grassy bit, then an uphill, then another grassy bit, then uphill. It was pretty quick, truthfully, as the trail gained eleavtion. 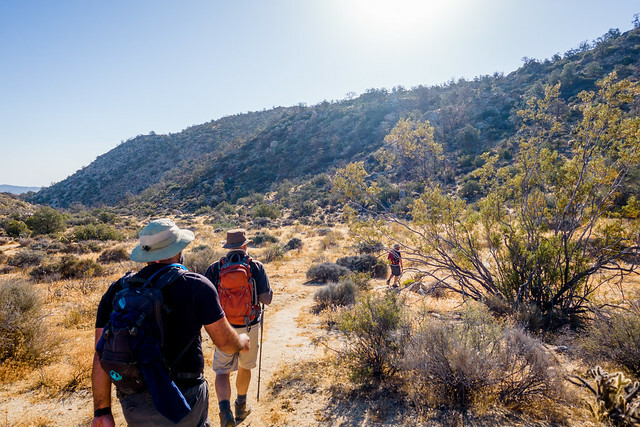 The trail isn't official, but it's pretty easy to follow--though the cholla were jumping today, I think we all brought home some stickers. 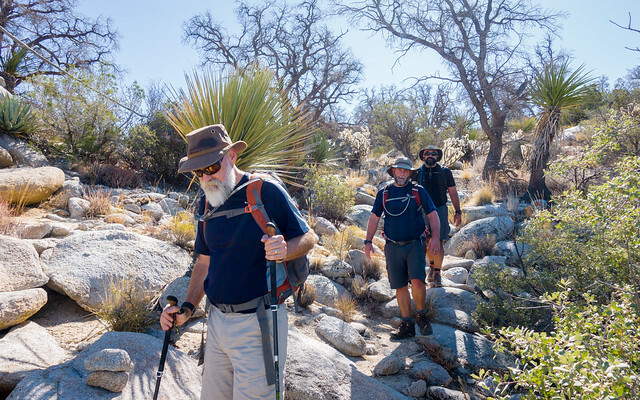 After the trail had gone up in elevation a few hundred feet, the junipers and the pinyon pines and oaks became more noticable, and the woodlands felt like something in southeastern Arizona... and not San Diego County. Many of the pinyons were dead, lots of the agaves had bloom spikes, and there were some really tall nolina grasstrees along the way, taller than me (which isn't saying much, really). 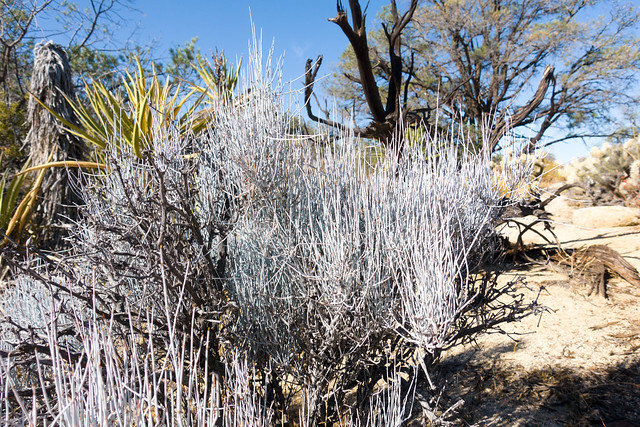 The Mormon Tea plants were an interesting blue-gray color too, and not their usual green. Maybe a different species? 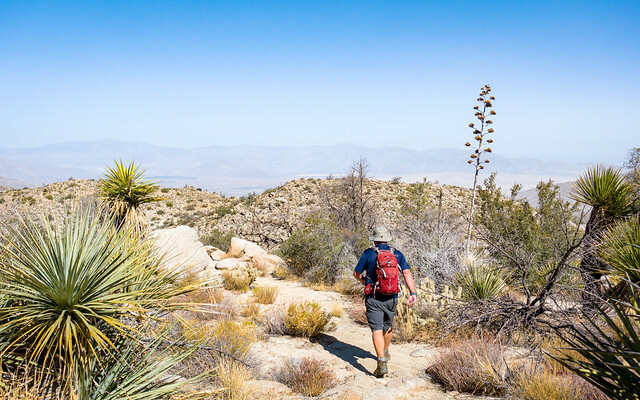 It was curious countryside--while there weren't ocotillo, there were most of the usual desert plants, plus interlopers like manzanita and white sage. Down, of course, is always faster--though the trail wasn't as obvious as it was going up. There's a sharp right turn that leads out of a sandy wash, and then the trail scoots in an odd direction up and over a little shoulder before the last scramble down into that scrambly bouldery wash.
A good day all in all. I'm looking forward to visiting in the springtime. 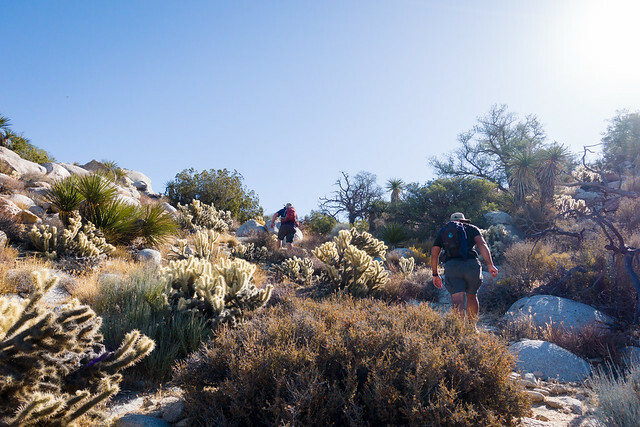 With the pretty significant changes in elevation, it'd be a good trail to chase wildflowers on, and you wouldn't have to be quite so picky as to the dates for peak bloom, just go up or down a few hundred feet as needed if its warmer or cooler than typical.